Feeling Fat - Is It All In Your Mind? How I perceive myself moving through the world can be very 'Sybil-ish' depending on what day you catch me. Most days I feel content. I can recognize that the world is my oyster, even if I don’t feel like shucking any looking for pearls. And on good days, i can still muster up the ‘I can conquer the world!’ feeling – usually when I’m feeling particularly fit and healthy - or the handsome UPS man has tossed me a smile. But, on the odd bad day, I might just leave the house feeling a bit, 'I'm not worthy...I'm not worthy-ish' especially if my pants seem like they're suddenly a size too small. I'm aware feeling unworthy is not an intellectual reaction to the way my pants fit, it’s emotional, but it still feels real and can effect my behavior. How many of us can claim to have a realistic perception of what we look like on any given day? If you’re experiencing a bad hair day, you think your pants are too tight, or you realize that today when you look in the mirror your mother is smiling back at you, you’re probably allowing your body image to dictate how the rest of your day is going to go. Having struggled with my weight off and on over many years, I have had some real dicey perceptions about my own image. Admittedly, as I get older I care less about how I look and much more about how I feel. Am I healthy? Do I feel strong and limber? What about endurance? Can I get through my day with a reasonable amount of zip and zest? Am I controlling my stress so that I’m able to enjoy my work and the people in my life? These are much loftier goals in my view and infinitely more challenging because I can no longer take any of them for granted. The Body Image Workbook: An 8-Step Program for Learing to Like Your Looks by, Thomas F. Cash, Ph.D. Tags: body image , mindfulness , self love , self image . I was in a bookstore and came across "The Big Book of Relaxation: Simple Techniques to Control the Excess Stress in Your Life, edited by Larry Blumenfield. Editor Blumenfeld has gathered some of the biggest names in alternative healing to discuss how to unwind and detoxify our souls and bodies. John Harvey provides a good basic chapter on meditation. Lilias Folan, of videotape fame, gives instruction on yogic relaxation. Shakti Gawain provides information on creative visualization. Feminist musician Kay Gardner gives hints on how music can soothe the savage nerves. There are other chapters on mind machines, on aromatherapy, and even on nutrition for relaxation. This "big" book is certainly a good start, but it occurs to me that creating your own self care book, or "tip" jar, might even be more valuable. Become in tune with what makes you relaxed, happy and fulfilled, write a note to yourself to actually do those things when stress levels have you so uptight that you can't think. Just open your personal relax book or relax tip jar and make the time to do it. Have a pleasant weekend one and all, you might even start to build your personal relaxation tips. Yesterday's post, Managing Type 2 Diabetes with Carbohydrates, discussed how healthy carbohydrates can help with insulin control. Whole wheat is also a healthy choice for any one managing their weight or cholesterol. Chapati or chapatti is a type of roti or Indian bread eaten in South Asia and East Africa and is traditionally served with cooked dal (lentil soup) or vegetable Indian curry dishes, but you can use them as sandwich wraps as well. Today's recipe, which comes from the Wheat Foods Council, is very easy and fun to make. Enjoy! Tags: chapattis, healthy recipe, whole wheat chapattis. Interesting bit in Sally Squires’ column in the Washington Post yesterday. Seems researchers are examining the effect of a vegan diet on Type 2 diabetes control. Dean Ornish, famous for his work in helping reverse arterial blockages in heart disease, has published one study that shows diets rich in whole grains, beans, fruits and vegetables – healthy carbohydrates, in other words – helped some folks cut insulin and other medications as well as improve blood cholesterol levels. The National Institutes of Health has another study going that’s looking at a similar dietary regimen and coming up with similar results. The interesting thing, of course, is that this flys directly in the face of current thinking that says diabetes control requires limited carbohydrate intake. It appears that in the right circumstances, which includes the right carbohydrates and apparently other foods, carbohydrates aren’t a problem for Type 2 diabetes. Trouble is, a vegan diet is extremely hard to follow. Which makes this interesting news, but something that probably won’t ultimately mean much to the millions of folks struggling to prevent or control this disease. There is something that’s a lot easier to implement. It’s called a healthy lifestyle. As we all know, even that is a challenge on a daily basis. Still, it’s middle of the road compared to a vegan diet. There’s been a lot written about finding motivation. If you feel the need to make some changes in your life, finding motivation is key to getting started. Lets face it, it’s easy enough to accept intellectually that a change is needed, but knowing doesn’t necessarily get us off the couch, out of the frig late at night, or create more quality time to spend with our family. So why is finding true motivation so elusive? That feeling which makes you want to hop out of bed in the morning and dust off your walking shoes? Maybe you’re going about it all catty wompus. One theory regarding getting started comes from an idea based on the five stages of change. This theory states that if you’re on a journey to change behavior, but begin in the wrong stage of change, you're likely to fail. • The first stage is pre-contemplative, when you're likely to dismiss the idea of change outright. • The second is contemplative, when you begin thinking about how the change would actually fit into your life. • The final stage is maintenance, when the new behavior becomes a habit. • Maintenance, the ability to maintain the new status quo. Of course, within this model there's relapse. Relapse is likely to occur at least once if not a few times throughout the 5 stages of the process. Think of it like falling off a horse — the best thing you can do is get right back on again. However, if you do “fall off the horse” and relapse, it is important that you do not fall back to the pre-contemplation or contemplation stages. Rather, restart the process again at preparation, action or even the maintenance stages. Just remember, everyone relapses. Its called being human! Tags: mindfulness , motivation , healthy lifestyles , lifestyle changes . This recipe from the Pacific Coast Farmer Markets' Association contains a lot of healthy "stuff" that will be sure to please! For a more colorful presentation, consider making a tri-color version with red and yellow peppers as well. A summer feast that's festive as well! Cut a slice in stem end of peppers. Remove seeds and thoroughly wash. Bring 3/4 cup salted water per pepper to boil. Add peppers and cook for 5 minutes. Remove peppers. Preheat oven 350 degree. Cook beef, garlic and onion in skillet till onion is tender. Drain off fat and stir in salt, rice and half the tomatoes. Heat mixture until tomatoes are softened. Stuff each pepper and stand upright in baking dish. Top with remaining tomatoes and bake, covered 45 minutes. Uncover and bake an additional 15 minutes. Tags: bell peppers, healthy recipe, stuffed peppers. When does “having hope” cross the line into "unrealistic expectations"? Let me explain. For three weeks, I planned that I would “glaze” my hair at the end of the day, with one of the new hair coloring products. To have the most successful hair transformation experience, no styling products should be used 12 hours prior to application, or so saith the box. The first morning I washed my hair, and dutifully skipped the gel, crème, and leave-in spray conditioner that makes the difference for me between a hair-do and hair-don’t. Then that evening, I decided that I was too tired to actually do the deed...I'd do it tomorrow. As one day slipped into the next I suddenly realized that I’d had three weeks of bad hair days. I wondered how I had missed the moment when “Hope”donned her superhero cape and became “Delusion.” Knowing that Delusion and Unrealistic Expectations are kissin’ cousins, I stopped and reassessed what I was doing, and thankfully was able to stop the silly sca-hair tactics. And yes, thanks for asking, my mirror and co-workers are recovering nicely. Not to put too fine a point on it, but if you’re “hoping” to get to your “ideal weight” and the last time in your adult life that you weighed that amount was more than 20 years ago, perhaps it’s time to stop and take stock. When I say “ideal weight” I mean the magic number that you’ve made up in your head, regardless of fact, science, or circumstances, that when achieved will be the key to everything else in your life magically becoming perfect. Might it not be a better hope to set your sights on feeding your body well, moving it and thinking about it in kinder terms? Lastly, truly enjoy every moment of this weekend – even if you have to force yourself! I posted this note last week, but a problem with typepad erased it. Because I'm on the road again this week, making the subject of this post very relevant, I'm posting it again. I don’t know why I always have the idea that my summers are going to be peaceful times when we can sit back and take things a little easier than the rest of the year. I always think with the kids out of school, we’ll slow down a bit and go through our lives a little more leisurely. WRONG! While this summer is presenting different activities, it’s really not that different from previous summers in terms of the things we have and want to get done. I’ll spare you the details, but suffice it to say that I think I’m gone more than I’m home. Of course, that leads me to the title topic. Whether we’re on the road, or just busy, busy at home, we often view feeding ourselves as a last-minute effort. The result: Thrown-together meals that may not do much for our well-being. The book Eating on the Run is becoming a classic for those facing challenges in feeding themselves well in the midst of their busy lives. It’s written by Evelyn Tribole, who also wrote the book Intuitive Eating, one of the first mass-market books on mindful eating. This summer, you might try reading this one on the beach in lieu of the latest romance novel. Well, maybe not. But it’s still a worthwhile read and reference book. Going to a food and wine festival may seem like an unlikely place to visit if you ‘re trying to reach a healthier weight, be more mindful about food choices, control portions, eat mindfully all the while trying to tune into your intuitive self. But, the idea that you can get out, walk around for as many hours as you can stand it, to sip endless varieties of wine while eating scrumptious bit size samples of regional cuisine and still work within the perimeters of a healthy eating and exercise plan is exciting! Not to mention events like this provide you another opportunity to socialize, meet new, interesting people within your community who share a passion for food, wine and all things delicious. These are all good enough reasons, in my book, to consider Googling some such event in your area. This weekend I had the good fortune to visit the 26th Annual Sonoma County Wine and Food Showcase, at the famous MacMurray Ranch and Winery (as in Fred MacMurray who owned the home as a fly fishing retreat for over 50 years), which featured the best wine and food this country has to offer. In this part of the country, perhaps more than many others, there is most definitely an affinity for healthy eating and organically grown produce. What I was reminded of this weekend, was how fantastic fresh produce is and how interesting and delicious it can be when prepared with respect, vision and love. This year's event sampled some of the best wines in the world, from at least 120 Northern California wineries accompanied by the culinary talents of over 50 chefs, featuring natural and organic foods grown locally. Boy, was it hard to pass up some the gorgeous looking concoctions, in fear you'd pass up something even more enticing just around the next corner. If you don’t drink wine, events such as these also provide, endless varieties of teas, juices, delicious all natural blended drinks, spring water or just about anything else your little heart desires. The summer is slipping by fast. Try to get out this year and enjoy what your communities have to offer, I think you'll be glad you did. Tags: epicurean , wine , healthy lifestyles , healthy eating . How Can I Eat if I Don't Know Calorie Content? Now if you think about it, for thousands of years no one had caloric content of their meals, and yet they managed to eat and thrive. Now in an age when one could argue that humankind is at another apex of knowledge and sophistication, no one knows how to eat without a biochemical analysis of their food. 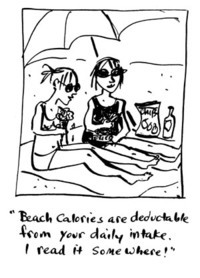 And furthermore, what do "calories" really mean on a personal level anyway - see the cartoon at right. We intentionally do not provide information such as calories, fat and carb grams, etc. Our program teaches women how to make healthy choices based on balance (as you will see, at the bottom of each recipe is a notation that tells what kind of food it provides, e.g, Grains & Starchy Vegetables, Protein Foods or Vegetables & Fruits). We also help women learn to listen to their bodies' cues to tell them when they need to eat and when they have had enough. Nutrition information as mentioned above distracts many women from listening to those cues -- they get caught up in preconceived notions about how much they 'should' eat and become distrustful of their bodies' cues which may tell them sometimes to eat more or less. I hope this helps you understand why we don't list nutrition information. ...and I hope you'll try out our free Recipes for Living at www.fitwoman.com or on this blog (select "Healthy Recipes" in the topic search. Tags: Calories , Healthy Recipes , Healthy Eating , Intuitive Eating .